The Nokia Mini Speakers MD8 are for you if you like to enjoy full stereo sound on the move. With a sleek, pocket-sized design and crisp stereo sound, these ultra-portable mini speakers feature battery power for playtime of up to 40 hours, an FM antenna to fine-tune frequency, and a tangle-free cable. This innovative design puts portability and great sound together in one pocket-sized speaker system. Add built-in cable management and FM radio and you’ve got a tidy little package. 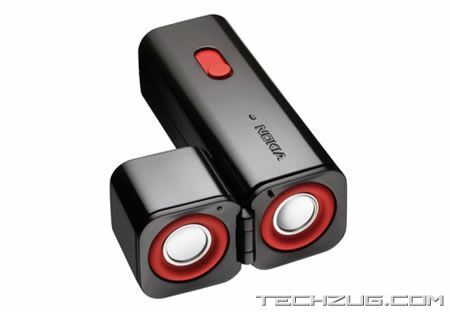 Widely compatible, the Nokia Mini Speakers MD-8 will begin shipping in the second quarter of 2008.